A business can function well and efficiently when different departments work in collaboration and make an organization function seamlessly. Various departments are linked and dependent on each other. For example, the manufacturing department in a company and the packaging department are dependent on each other, as if there is no manufacturing done then there is no need for packing. Similarly, a manufactured item cannot be sold without proper packaging. Then there are departments that look into the internal functioning of a company. One department that looks into recruiting skilled and talented people for these departments is the human resource (HR) department. The human resource department is in charge of the talent acquisition process in a company. There is one major difference between talent acquisition and recruitment. Recruitment is all about filling up vacant positions, while talent acquisition is about utilizing the right candidates and their talent to fill up positions and follow the same rigorous recruitment process for the future. For proper acquisition of talent, one has to foresee the future management of the business and analyze the past history of attrition. By doing this, one can predict what business lies in the pipeline and can create positions accordingly. 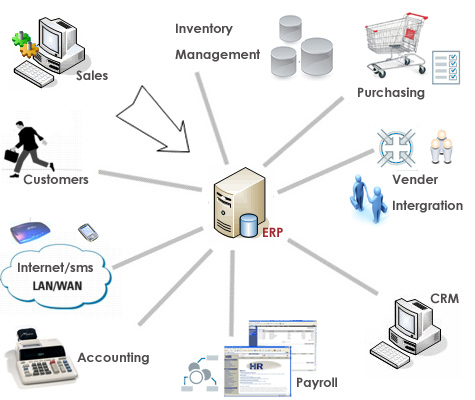 ERP or Enterprise Resource Planning is a type of software that uses modular systems to plan an integrated management system by coordination between various business processes. Over the recent past, various ERP software have been used for processes like payroll, accounting, operations, project management and human resource management. ERP software has been applied in the human resource department for talent management. This has paved way for collaborations between various ERP software vendors and talent management software vendors to function as one integrated system from which the client company can reap maximum benefit. Earlier, the ERP software looked into the basic processes of the HR department like payroll, administration work, and time management. However, with the recent collaborations between the talent management software and ERP software, the focus has shifted to achieving long term goals for an enterprise. Talent management looks into various areas such as performance management, goal management, talent acquisition, career development, learning management system, and succession planning. Thus one can say that talent management system is a more advanced form of enterprise resource planning as far as the human resource department is concerned. There are many companies that avail the manifold talent management system.